YOU CAN READ THE MALAYALAM VERSION BY CLICKING HERE. With the entry of 'Hi Defenition' technology creative changes happened in videography field, especially by including hi-definition video in DSLR cameras. Major reflection was the reduction of difference between amaetur and professional. Cameras and other equipments used for movie and advertisement shootings have conquered wedding and recording of other similar functions. motions are not felt by the body because of function of the brain. But when a foreign body comes in one's hand brain cannot control the motion of that element. So, when we operate a camera by running or walking we feel these non-uniform movements(shakes). This disadvantage has been overcome by the help of the equipment called steady cam. 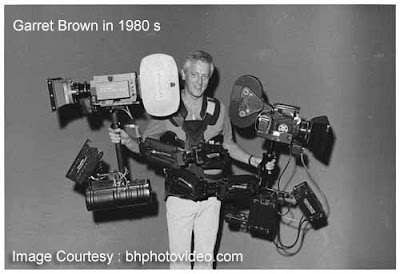 Hollywood camera man Garret Brown invented this equipment in 1973. It was named 'Brown Stebilizer' initially, and later Cinema products corporation of Hollywood owned the right of the technology and renamed it as 'Steady Cam'. In 1976 'Bound for Glory' the first movie shot by steady cam camera was released and grabbed best photography award by the Academy. 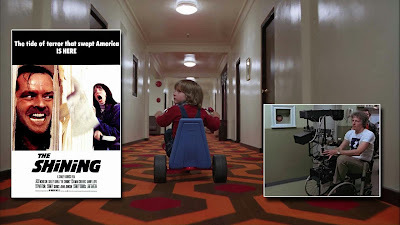 But the film world understood the mesmarizing beauty of steady cam through the phycological horror movie 'The Shining' photographed by Garret Brown himself. He arranged some special steady cam for the low angle shooting of this movie. Cinema products Corporation stopped production by 2000 and sold the right of the steady cam to the Tiffen company of New York. Sled, Iso elastic arm, & body west are the main parts of a steady cam. In these three, sled is the most important part, where the camera balances. Necessary stability can be obtained by slide even though west and arm are not available. Commercial and event cameramen use this equipment widely in these days. 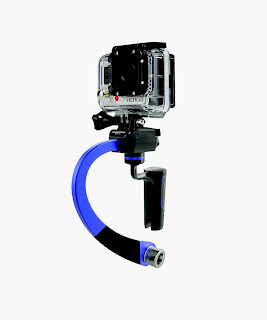 Platform, quick release base plate, horizontal/vertical adjustment pan tilt lock, gimbal, gimbal assembly, gimbel handle, sled post, weight, and weight plate, are the main parts of a slide. Higher end professional models have monitor dock, battery plate and mat box fittings. Actually, the equipment iso elastic arm is made like the arm of a human being. We can take only small shots by using sled. Iso ilastic arm and west are needed to shoot long scenes. Iso ilastic arm balances the movemnet of the cameraman and thus camera can be operated for a long time without any shake. Main spring, spring cassette, spring case, elbow, tension adjustment, spring & pin and quick release pin are the main parts of the arm. Single and double arms are also available. Some more improved movements can be shot by the help of double are which has fore arm and back arm. For easiness in walking or running shots tension knobe can be adjusted. Chest plate, adjustment rail, locking knobe, back pad, strape, shoulder buckle, chest buckle, hip buckle, and quick release mount are the parts of west which is also known as body pack. Different straps should be used to fix the camera with camera man's body. Chest plate and bride should be adjusted for shooting purpose according to the users body height and width. According to the convenience, buckles of one side should be opened and hand should be inserted through it to wear the west. This can be done alone, but it's always good to get the assistance of one person to fix equipment to the body. While the straps are tightened inhale normally. Shooting can be made smooth if the normal breathing is not be disturbed. Connect the iso electric arm to the west on the body and the gimbel handle to the arm to start the shooting. Above all three equipments take more time and care to connect the slide. Need to balance the camera exactly on position while connecting. A tea cup cannot be balanced on it's bottom by finger tip. But it can be balanced by the finger keeping the glass upside down. Same technology called low center of gravity is implimented in steadycam. If the mass of a material is closer to the ground the stability will also be more. You must have seen, tall built athlets falling down easily. The reason behind is the tallness of them. It happens because the body weight stays away from ground when the height is more. DSLR can be easily balanced easily mainly because of the shape of the camera. But balancing the video cameras are little bit difficult. Because of the handle grip on the video camera, the weight of the camera is more on that side. Balancing can be made easy by connecting an LCD hood on the opened LCD monitor. Balancing should be done by fixing the gimble handle on a stand. Do the vertical balancing first, on the sled platform. Turn the available knob little by little and lock it when it is suitably balanced by the user. After that turn the horizontal adjusting knob slowly and lock that also. After that place the sled Horizontally to our body,stand and release slowly. If the camera turns very fast or very slow, assume that the balancing is not proper. If we are sure that the vertical horizontal balancing is correct, weight adjustment is the next step. Four weights come normally with the slide. Two are heavy and two are light in this group. Connect the equivalent weight of the camera and try the balancing again. Take to connect the same type of weight. That means, if we are using the e lighter weight, them use both lighter weights. If there is still problem in balancing loosen the balancing bracket and increase or reduce the height of the slide. Even after doing all these things, if balancing cannot be acheived, that means the weight of the camera is not suitable for the slide or the slide is faulty. Practicing is necessary for using steadycam. By doing two simple things repeatedly in many days we can make the practice possible. For that one principle should be understood. Take a cup full of water and stretch it to the front of the body by the right hand. Then release the elbow little bit and walk in straight line, assuming our hand is a shock absorber. After some practice we can walk without spilling the water from the glass. But by keeping the cup closer to our body, this may not be possible. In most of the new cameras, center point can be marked on the LCD screen. Switch on this facility. Mark some cross or zig zag lines one the walls of the practicing area. Use colour insulation tapes can be used for the same purpose. Then switch on the camera and and try to move in a straight line, but not distracting the LCD centre point from the mark on the wall. Do the same thing by changing the zoom lens ranges of the camera. Play the recorded shots and continue the practicing till you are self satisfied. Another important thing to be noticed while using the steady cam is to hold the right hand on the gimber handle and using the three fingers of the left hand give a small support on the slide post. This support is for balancing the frame. Second practice needs some more space. Sea shore or open area places can be used for this purpose. Draw a broad straight line of 25 feet. Walk through this line with properly balanced steadycam on the body. See if you can hold the camera exactly on top of the line and not moving the camera to the sides. Try this method by walking upwards and backwards. Turn the camera towards the subject from the straight line. Legs should be on both sides of the straight line. Step back once behind and cross the right leg covering the line to left side. No both legs are in left side. Turn the body without changing the directions of the camera , where we shoots. And slowly move forward, Now the camera shoots behind us. Be sure that to keep the camera position in a straight line. Start the practicing in a slow speed, then increase the speed, and then run and shoot. Always take the support of a helper during this practice session. Shoes should be tightly done just like the body west while doing this practice shooting. 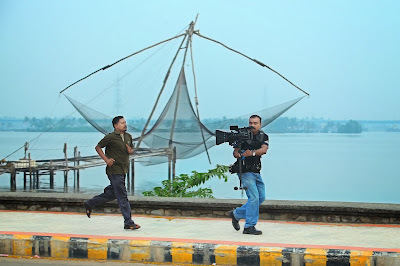 If this practicing can be done properly one can be a good steady cam operator using his own creativity also. Wide medium and wide lenses are normally used in steadycams. Focus problems can be avoided using these lenses. But wireless focus pulling method is used while using tele/block lenses. 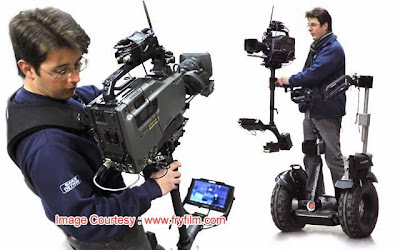 Equipments used in film industry is very expensive. 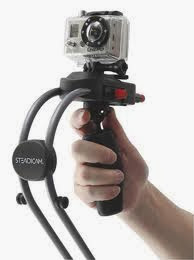 Garet Brown, Inventor of the real steadycam also invented Merlin steadycam which is easy to use and handling. Garet Brown introduced this camera with the pet name 'Steady cam junior' in 1990. Cameras upto 2 kg can be easily connected to this equipment for recording. Steady cam with the name 'Smoothee' which is in the same merlin design is aimed for i-phone, Go pro- Hero 2/3/ 3+ etc. 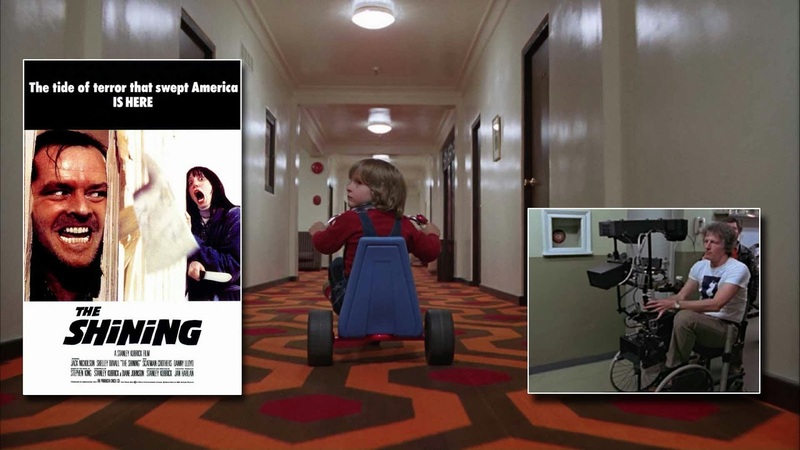 Seg way is a personal travel aid which runs on two wheels and battery. Dean Camen introduced this vehicle to the world in 2001. By connecting the steady cam to the segway, very good shots became possible. The shots by Casen Jacobson in 2009 at Euro vision music competition is considered as the best seg way steady cam shots ever. It's a shot of coming in a segway from the back side of audience, in a high speed and getting down in front of the stage and jumping onto the stage and rotating the camera around the singer and the guitarist three times. See the Shot and its Making here in You tube embedding. It's a new generation steady cam. Even though this is designed and made for low angle shots by walking or running, usage is not widely accepted. 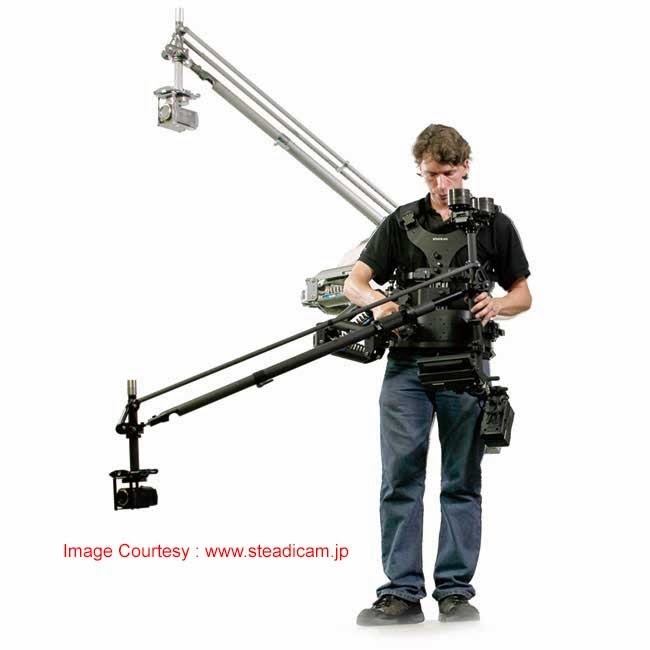 Heavy and large cameras cannot be used on this steadycam. But high quality go pro and hero 3 action cameras can be used to solve this issue.